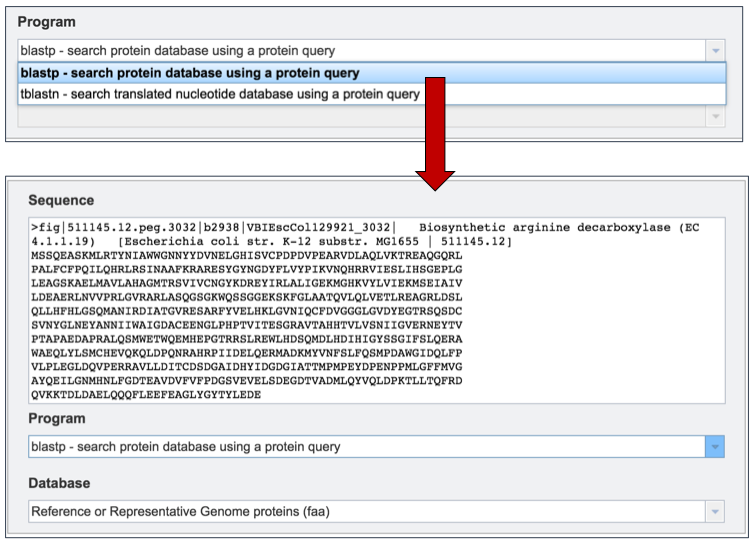 The Reference or Representative Genome proteins (faa) includes those genomes that RefSeq has given special status(2). The reference genomes represent the highest quality dataset that is supported by curation by NCBI scientific staff, and the representative genomes are another high-quality selection that were identified at RefSeq by clustering genomes and applying weighting metrics that include consideration of species-level taxonomic classification (e.g., a preference for type strain) and assembly quality (e.g. a preference for complete genomes but WGS is allowed). 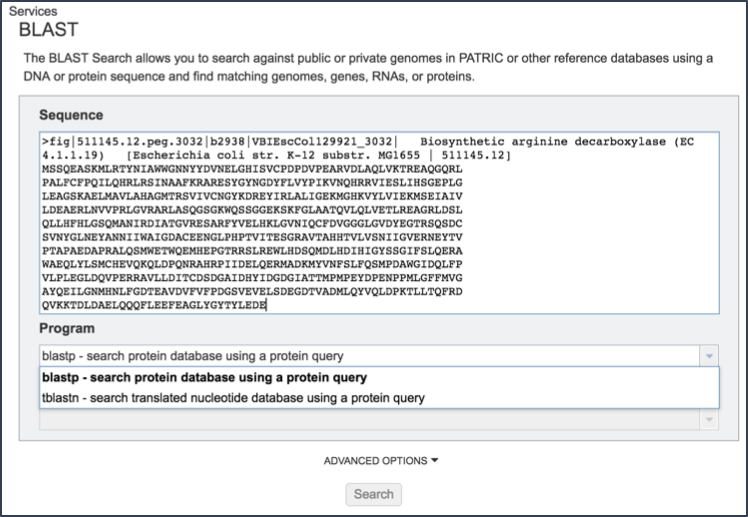 Transcriptomics Genomes proteins (faa) include all the proteins that are found in any of the microarray experiments that are included in PATRIC. Specialty gene reference proteins (faa) contain all the genes used by PATRIC to tag genes that are of special interest. These include genes that have been identified as being virulence factors, as important in antibiotic resistance or susceptibility, are homologs with human genes, or have been investigated as being a drug target. 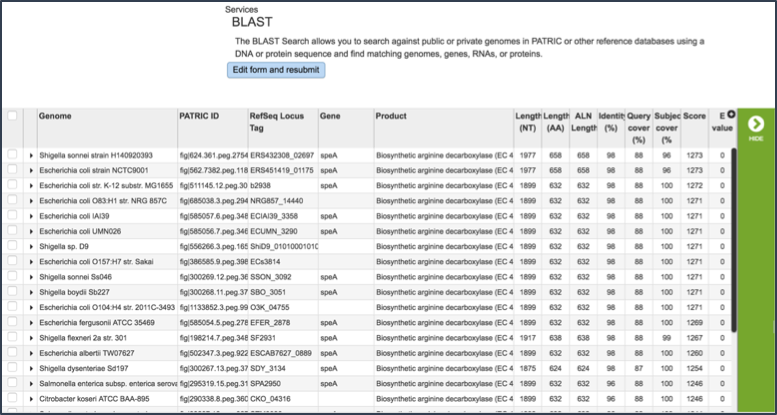 Search within a selected genome(s) allows researchers to choose specific genomes that they wish to BLAST against. 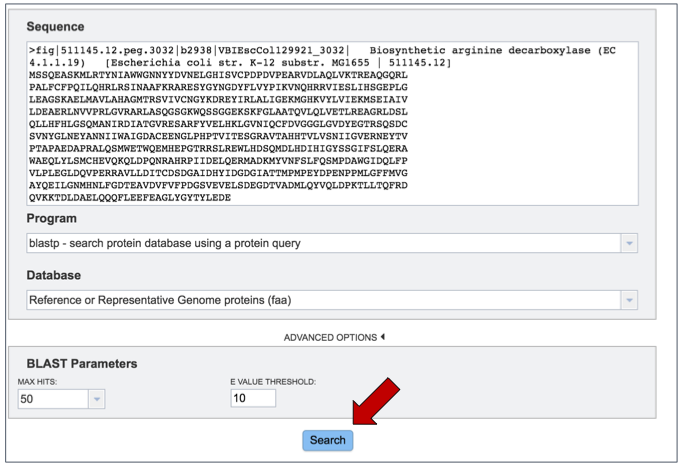 Search within selected genome group allows researcher to BLAST against any of the genome groups that they have created and are stored in their workspace. 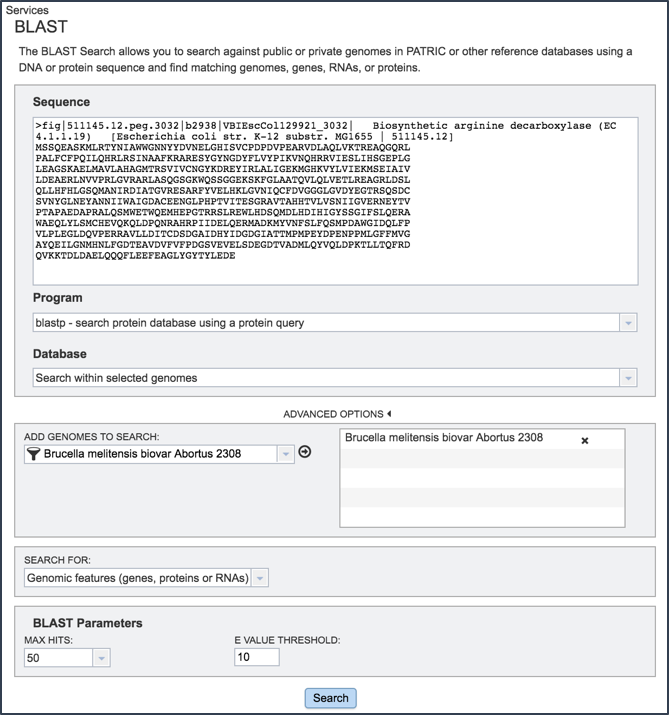 If the sequence selected for BLAST analysis is nucleotide, the available databases are as follows: •	The Reference or Representative Genome genes (fna), or fasta nucleic acid, includes those genomes that RefSeq has given special status(2). .fna is used generically to specify nucleic acids. The reference genomes represent the highest quality dataset that is supported by curation by NCBI scientific staff, and the representative genomes are another high-quality selection that were identified at RefSeq by clustering genomes and applying weighting metrics that include consideration of species-level taxonomic classification (e.g., a preference for type strain) and assembly quality (e.g. a preference for complete genomes but WGS is allowed). This will include non-coding sequences, like intergenic regions. 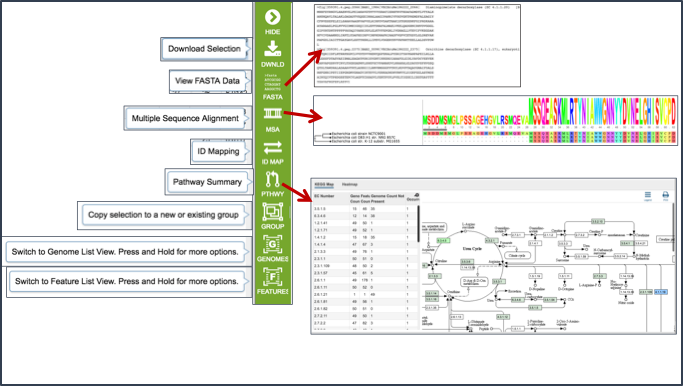 The Reference or Representative Genome features (ffn) is the FASTA nucleotide of gene regions, and this database contains all the coding regions across this special selection of genomes. The Reference and Representative Genome features (frn) is the FASTA non-coding RNA, and includes all the non-coding RNA regions for a genome (tRNA, rRNA). 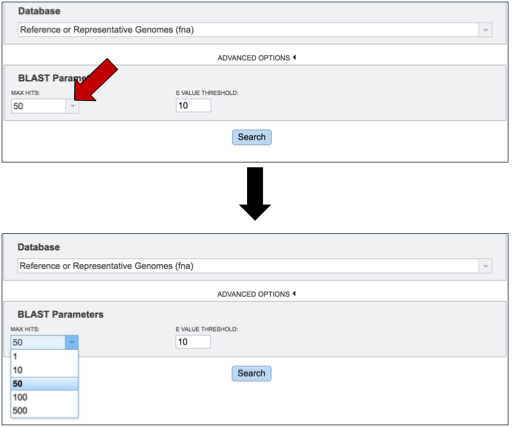 PATRIC 16sRNA genes (frn) includes all the 16s rRNA genes across all the genomes available in PATRIC. Transcriptomic genomes (ffn) will BLAST against all the genome sequences that have expression data associated with them that are publicly available in PATRIC. This will include non-coding sequences, like intergenic regions. 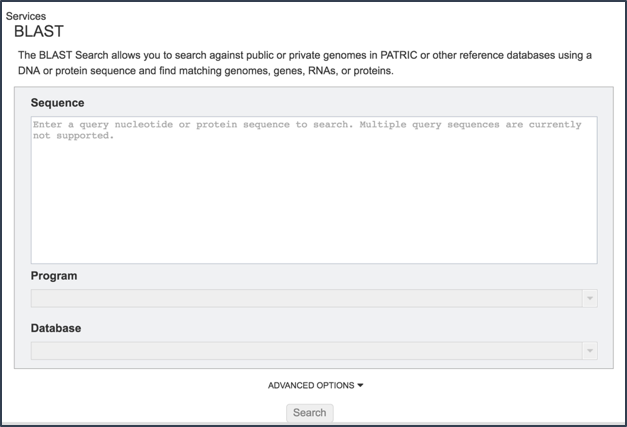 Transcriptomics Genomes feature (ffn) will BLAST against all the coding sequences from the genomes that have expression data associated with them that are publicly available in PATRIC. Plasmid contigs (fna) will BLAST against all the sequences identified as coming from plasmids that are available in PATRIC. This will include non-coding sequences, like intergenic regions. 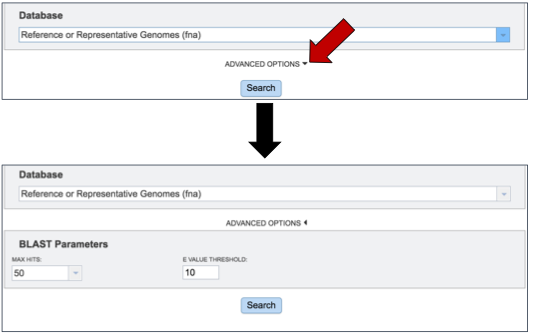 Search within selected genomes allows researchers to choose specific genomes that they wish to BLAST against. A direct link to the genome landing page that the feature belongs to. Boratyn, G.M., Camacho, C., Cooper, P.S., Coulouris, G., Fong, A., Ma, N., Madden, T.L., Matten, W.T., McGinnis, S.D., Merezhuk, Y. et al. (2013) BLAST: a more efficient report with usability improvements. Nucleic acids research, 41, W29-33. O’Leary, N.A., Wright, M.W., Brister, J.R., Ciufo, S., Haddad, D., McVeigh, R., Rajput, B., Robbertse, B., Smith-White, B., Ako-Adjei, D. et al. (2016) Reference sequence (RefSeq) database at NCBI: current status, taxonomic expansion, and functional annotation. Nucleic acids research, 44, D733-745.